Did you ever consider giving a piano tuning as a gift? I can print a lovely certificate with your recipient’s name on it. To order yours, call me at 916-215-9921. I always used to recommend The Piano Book by Larry Fine. It was first published in 1987 and already has had several editions. It is primarily written for people who are planning to buy a piano, but it’s also great just for learning how pianos work and what piano technicians do. But now you can just visit his website at http://www.pianobuyer.com, which has all the same information and is updated regularly. Posted by mstivers1201 in Blog. I just discovered the website Piano Price Point. This has complete listings of current pianos MSRPs, a blog on industry news, and a very limited listing of piano technicians. You should also look at the Blue Book of Pianos, which lists new piano prices and will appraise your used piano for a fee. But best of all is Acoustic and Digital Piano Buyer, edited by Larry Fine, author of The Piano Book. This gives you a mountain of information for buying and maintaining a piano. Although I am still in the Yellow Pages, in recent years I have received far more referrals from Angie’s List. If you subscribe to Angie’s List, please go look at my reviews. If I have already tuned your piano, please leave a review! Angie’s List is a great network. My wife and I use it frequently to find contractors to do work on our house. If you want to donate a piano, the 88 Keys Foundation is a great resource. The 88 Keys Piano Donation program facilitates the donation of privately-owned pianos in good working condition to K-12 public schools, and maintains a “Key by Key” donation program through which individuals and corporations can purchase a single piano key or 88 keys for an entire piano. 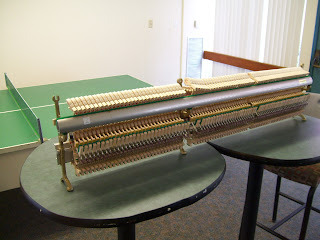 Many piano owners know the old saw about not putting your piano on an outside wall. That applies to an old house where the walls are drafty — humidity changes could affect the piano and put it out of tune, or cause the wool bushings to swell and create sticking keys. In modern homes, the insulation is good enough that you can put the piano anywhere. But don’t leave a window open near the piano, or you’ll be creating the same problem.